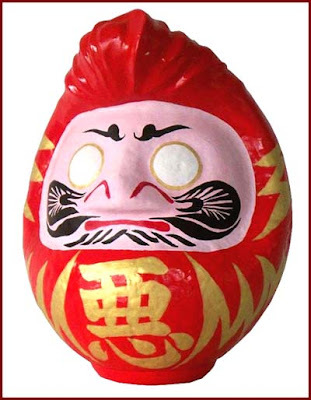 The Daruma is a traditional Japanese talisman for focusing on personal goals. 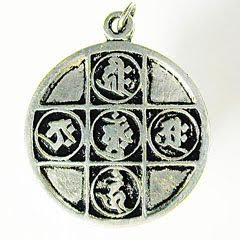 Modeled after Bodhidharma, the founder of Zen Buddhism, it is a popular offering of encouragement. When one is received, set a goal or make a wish and fill in one eye to illustrate your intention. 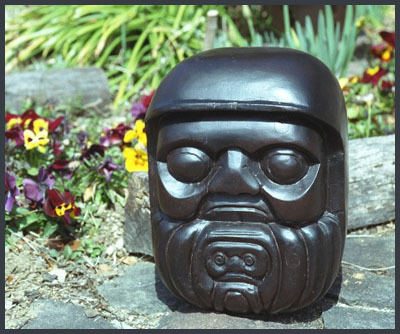 The other eye watches over you as a constant reminder and guide. 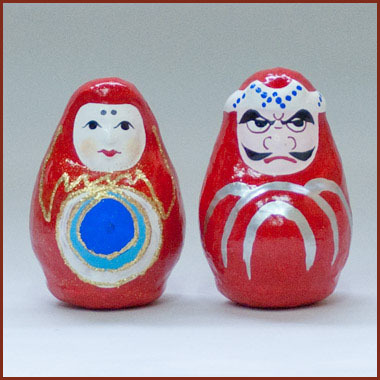 Once your goal is reached, fill in the other eye and display the Daruma as a symbol of your success.
. . . CLICK here for their beautiful mandala paintings !
. . . CLICK here for Photos of the womb world mandala! 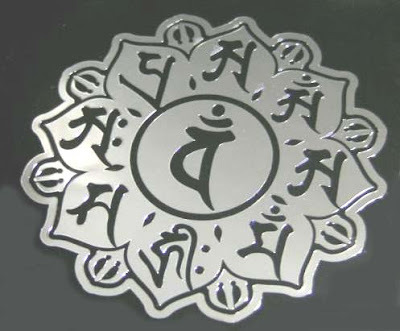 Hoo Mandala 法曼荼羅 "Buddhist Law Mandala"
. . . CLICK here for 法曼荼羅 Photos !
. 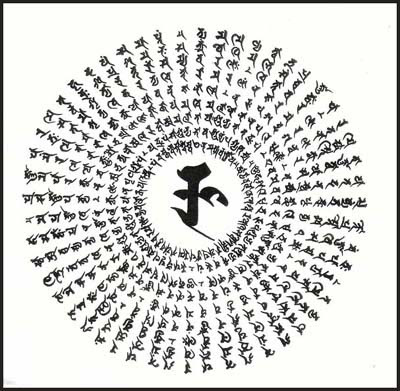 . . CLICK here for 種字曼荼羅 Shuji Mandala Photos ! 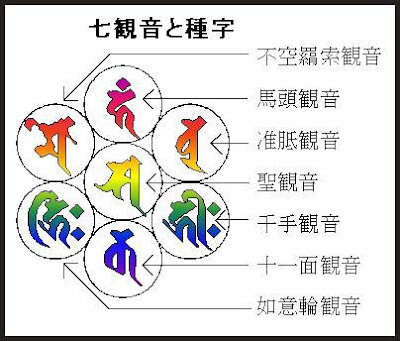 Seven Kannon Temples of Tono .
. MANDALA or MANDARA 曼荼羅 . The hair is kept in place with a lot of pomade and wax. It got its Japanese name from the Regent street in London, where it was often seen. 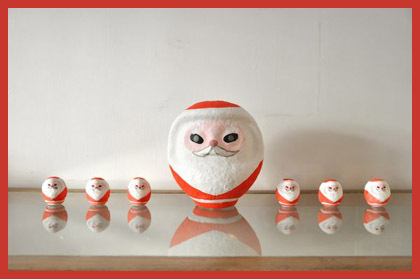 It comes in many varieties, even as a piggy bank.
. . . CLICK here for Gure Daruma Photos ! is a style of haircut which takes its name from Madame de Pompadour. The pompadour was a fashion trend in the 1950s among male rockabilly artists and actors. In recent years the pompadour hair style has been adopted by those enamoured with vintage culture of the late 50s and early 1960s that includes antique cars, hot rods, American folk music, rockabilly bands, and Elvis Presley. In modern Japanese popular culture, the pompadour is a stereotypical hairstyle often worn by gang members, thugs, members of the yakuza and its junior counterpart bōsōzoku, and other similar groups such as the yankii (high-school hoodlums). In Japan the style is known as the "Regent" hairstyle, and is often caricatured in various forms of entertainment media such as anime, manga, television, and music videos. A pompadour is often created by combing the sides of the hair back, while fanning the top of the hair forward and curling over itself. There are numerous ways to sculpt a pompadour. Some only curl the front few inches of their hair up, while others comb their hair back and use their hands to "push" it into its desired place. The big red one is the Mother, the blue one the Father and the little white one the child. 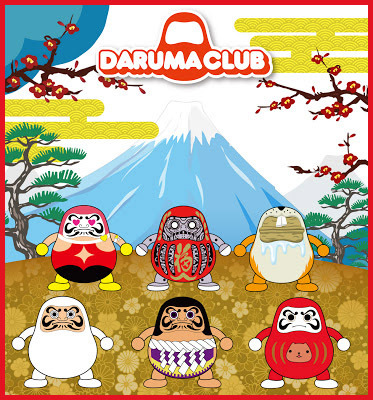 Thus the Daruma family represents kaka denka　かか天下 where mother has the saying to keep the family in harmony. This is a real roly-poly doll with a special weight at the bottom. 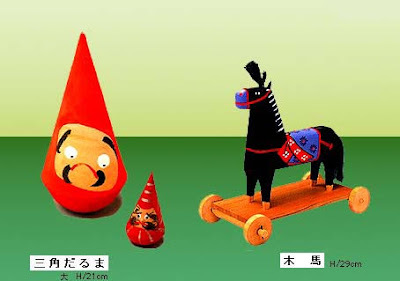 In 1806, the first generation Imai Denjuuroo started making these dolls in the tradition of clay dolls from - Fushimi - Kyoto with the colors mixed with laquer. 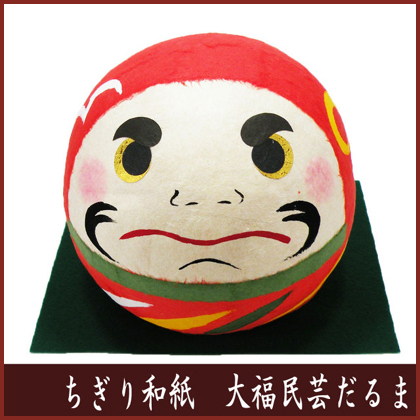 famous Imai Tokujiroo of Suibara in Niigata Prefecture. He passed away when he was almost 100 years old. 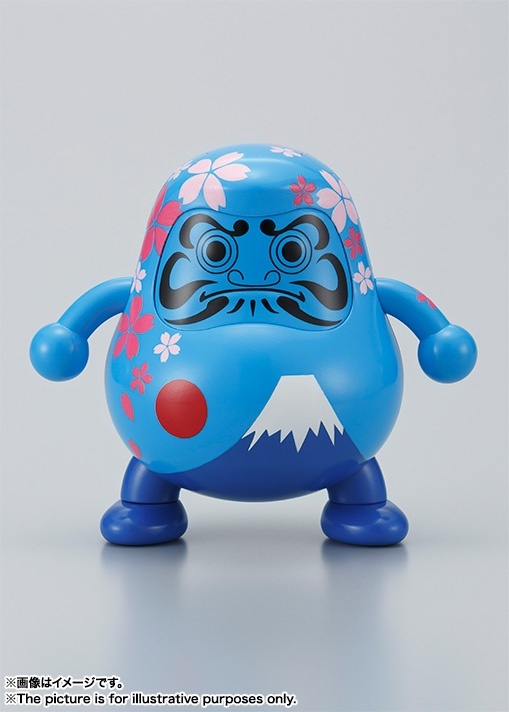 The Family Imai is now in the eights generation producing this funny Daruma. It has become a standard present in this area for a wedding and at the birth of a child. 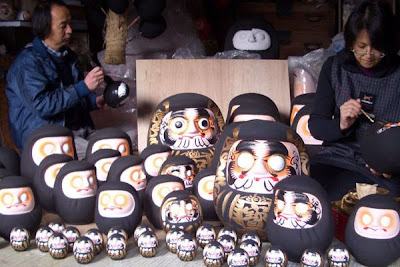 Some of these dolls are now also made in other areas and also of other materials, like paper or wood. The paining of the face is a simple dot eyes, dot-nose and mouth-line, and is quite humorous. 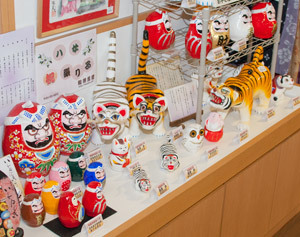 There are a few varieties of these dolls in the Tohoku region, but their origin seems to be in Aizu Wakamatsu, Fukushima. 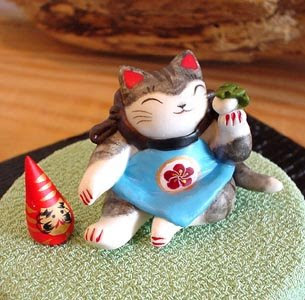 Since it is a strong symbol of getting up again (okiagari), it was well loved by the silk farmers, as an amulet to hope the silk worms would "get up" and produce a lot of thread. Fishermen put it in their boats to "get up" when they were in a difficult position at sea. 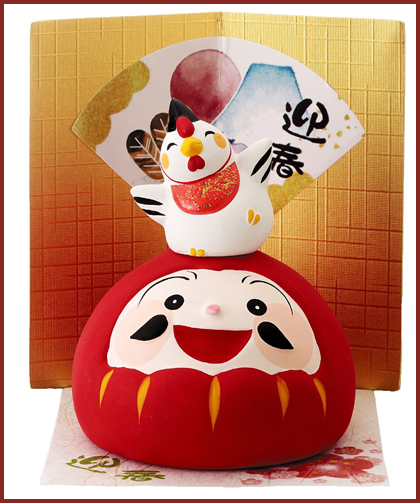 Since the bottom is heavy and the doll stands up allways, it is a good-luck charm for the local fishermen of Niigata, who “want to float a boat in need as fast as possible”, a play with the word “uki-agaru”, to get up, to float. 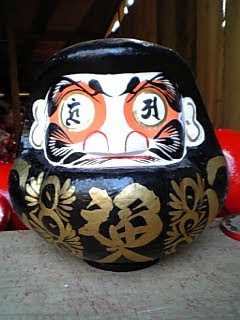 The famous Zen priest Ryookan (Ryokan) also painted a triangular Daruma. 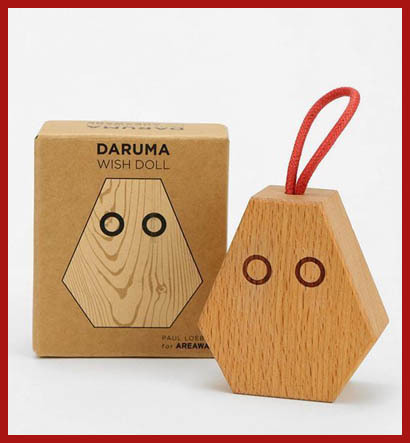 On the first picture you can easily recognize our triangular Daruma, one with a simple face and a small one with eyebrows and beard and stripes on the long head. 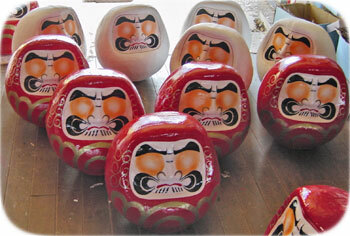 These Daruma are also called “Tsuno-n-gyoo” (Dolls with a horn) or “okorobi” (the falling-down doll). 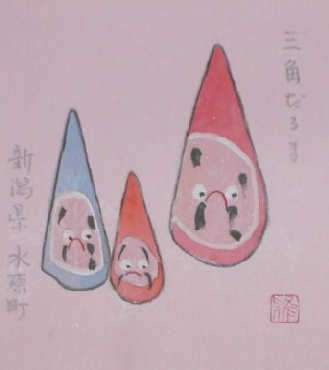 On a page of a collector of bookmarks (shiori) there is also a nice one with our triangular Daruma. It is a woodblockprint with two of our friends.
. 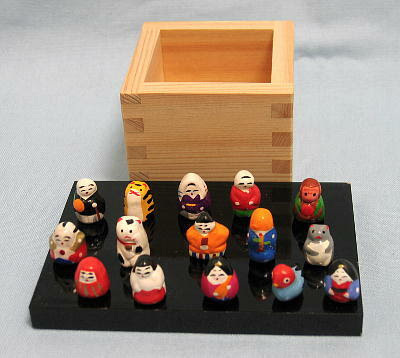 Folk Toys from Niigata . 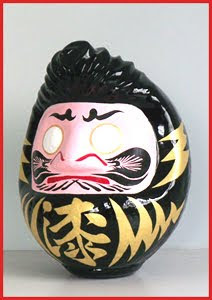 Made with the wish for writing black figures in your business.
. Charcoal Daruma from Nagano . This region was famous for its white coal for the tea ceremony.
. Ono no Komachi 小野 小町 . They sold charcoal in small amounts to the poor people of Edo. a mirror . . . . .
on the last day of the year . . .
uzumibi 埋火 (うずみび) "hidden fire"
Some charcoal is left under the ashes to smolder and provide a bit of warmth. Gefäß, das über ein Holzkohlefeuer gestülpt wird, um es zu löschen.
. . . CLICK here for sumitori Photos !
. 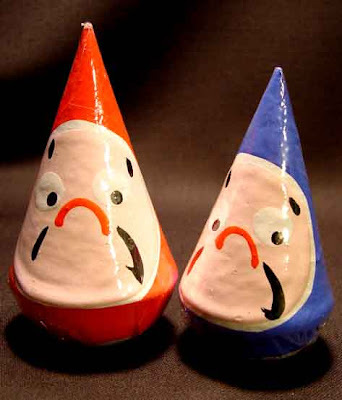 . . CLICK here for ubu Photos ! goheita 五平太（ごへいた）Kyushu dialect. Named after one Koheita, who first dug it out of the ground in Kita Kyushu. Often used for the small burners for grilling fish and vegetables.
. sumigama 炭竈 charcoal kilns . 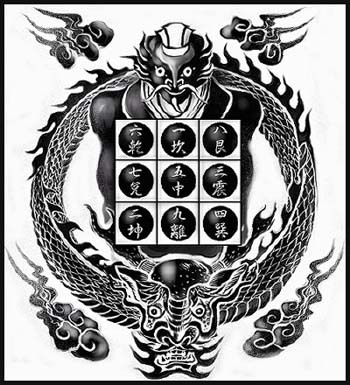 or binchō-zumi (備長炭) is a traditional charcoal of Japan. 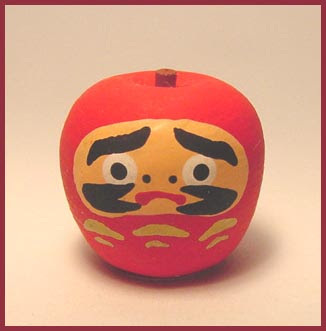 It dates to the Edo period, when during the Genroku era, a craftsman named Bitchū-ya Chōzaemon (備中屋 長左衛門) began to produce it in Tanabe, Wakayama. 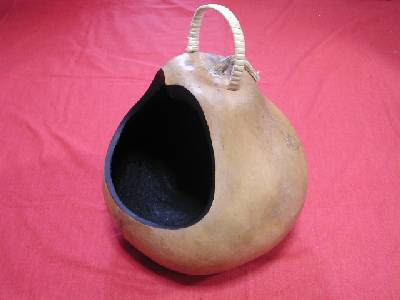 The raw material is oak, specifically ubame oak (Quercus phillyraeoides), now the official tree of Wakayama Prefecture. Wakayama continues to be a major producer of high-quality charcoal, with the town of Minabe, Wakayama producing more binchō-tan than any other town in Japan. 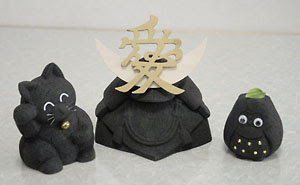 The fineness and high quality of binchō-tan are attributed to steaming at high temperatures. Although it is often thought that binchō-tan burns hot, it actually burns at a lower temperature than ordinary charcoal but for a longer period of time. Because it does not release smoke or other unpleasant flavors, it is a favorite of unagi and yakitori cooks. 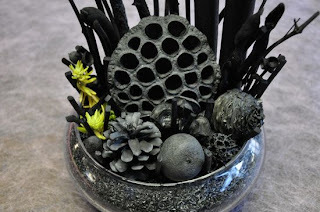 Due to difficulties in identifying the producing region, the name binchō-tan has come into broader use to designate white charcoal generally, and even products from outside Japan, as well as those made of other species, have come to use the name. The amount of binchō-tan sold domestically in Japan markedly decreased following a 2004 export restriction promulgated for forest protection by the People's Republic of China. 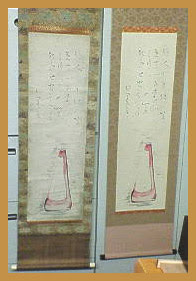 To differentiate the aforementioned "non-pure" products, there is a movement to call binchō-tan produced in Wakayama Kishū binchō-tan. 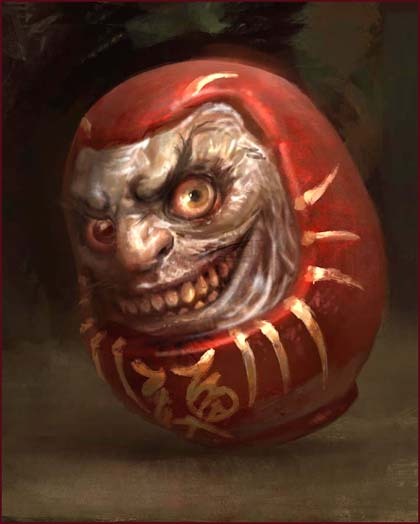 Binchō-tan has found uses other than as a fuel. Because it has numerous small pores, it can absorb chemical substances. Bits can be added to rice during cooking to remove chalky flavor, placed in shoe-cabinets to absorb odors, and put in rooms to freshen the air. There are many more supposed benefits and health values of white charcoal. 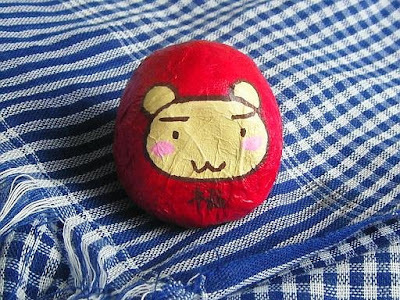 Currently there are a number of binchō-tan-based consumer products on the market such as socks, shirts, shampoo, cosmetic products, and many more. which is the very dangerous condition of the roads, arising when it rains on a still-frozen surface. 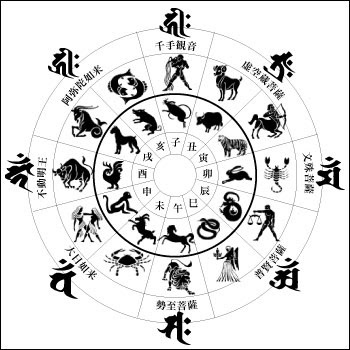 The ice is not, of course, black, but transparent -- it is the black of the road surface that makes the ice invisible and causes many accidents. the day following Thanksgiving Day in the United States, traditionally the beginning of the Christmas shopping season. On this day, many retailers open very early, often at 4 a.m., or earlier, and offer promotional sales to kick off the shopping season, similar to Boxing Day sales in many commonwealth countries. Black Friday is not actually a holiday, but many employers give their employees the day off, increasing the number of potential shoppers. 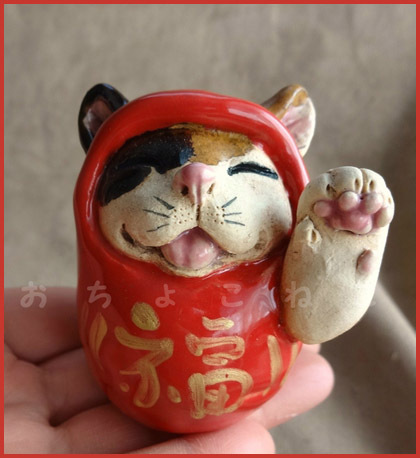 It has routinely been the busiest shopping day of the year since 2005 . . .
Made from powder of paulownia coal.
. Suwa no Sumi Daruma 諏訪の炭だるま .
. sumi ningyoo 墨人形 / 人形墨 dolls from Sumi writing ink .
. Black Dragon 黒龍 Kokuryu .
. Black Buddha Statues 黒仏 kurobotoke .